Give your signal a kick in the pants with this versatile booster. 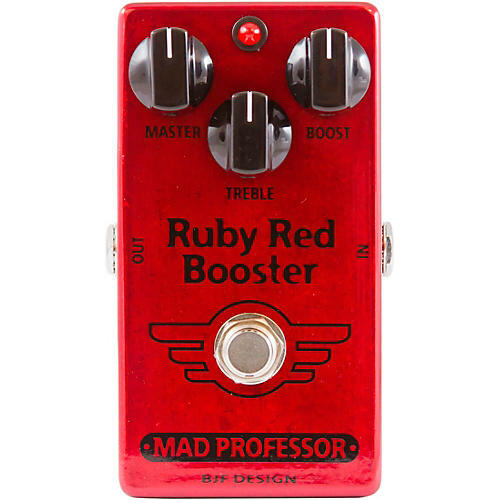 The boosters are based on the Mad Professor BJF Little Red Trebler and Red Rooster Booster, connected in that order and with a master volume control. You can use the pedal as a treble booster, a clean boost or an overdrive unit or any combination of the above. Also, it can be used with or without the buffer. The Treble Booster is a fine-tuned booster for just the right treble frequency with carefully designed bandwidth and an optimized slope of bass cut. The booster circuit is designed to overdrive the amplifier inputs from nice shimmer to heavy overdrive, thanks to the massive 40dB of boost. The booster is tuned so that it produces musical distortion by itself on higher boost settings. You can control the total level of the two boosters with the Master Volume control and also use the Master Volume to achieve distortion from the unit.